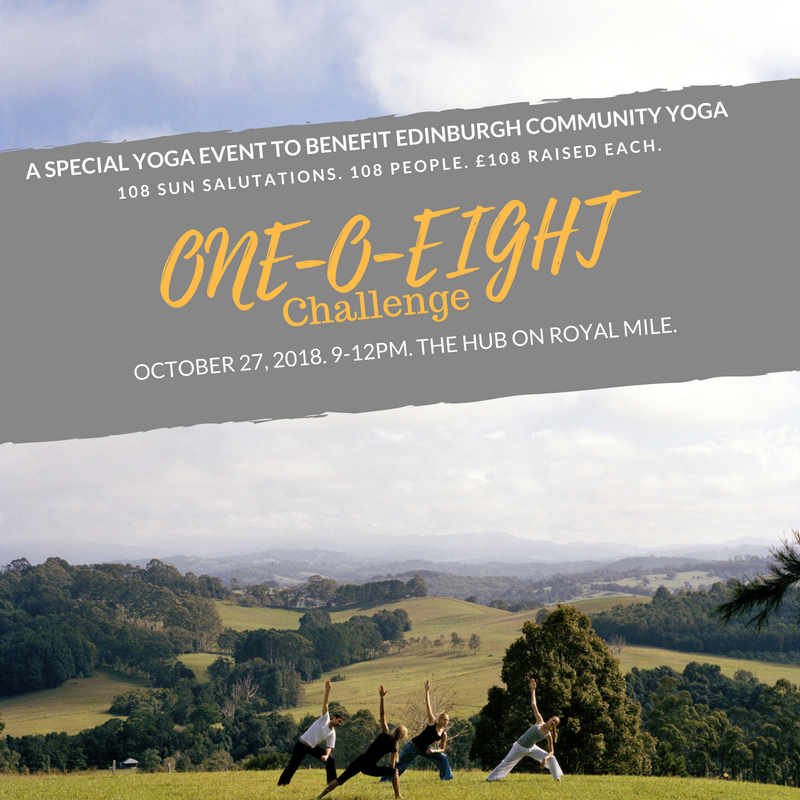 Sign up for the One-O-Eight Challenge to help Edinburgh Community Yoga continue our valuable projects. Follow this link to register for the 108 challenge, and hit the ‘start fundraising’ button to get going. In partnership with Meadowlark Yoga and lululemon Edinburgh Here to Be. Our aim is simple. 108 people. 108 sun salutations. £108 raised in sponsorship each. We know our yoga community can do this. Imagine being one of 108 people flowing through sun salutations together. Imagine the energy in the room that will support and inspire you in this incredible practice. All the while, knowing that you are doing this practice to enable others to access the incredible benefits of yoga that you are so familiar with. Edinburgh Community Yoga are excited about this opportunity to bring together so many people from the wonderful yoga community here in Edinburgh. Whether you’re a part-time yogi or a daily practitioner you will be welcomed. It’s not about getting it right, it’s about taking part and helping us raise much needed funds to support our outreach work over the next 12 months. So even if you’ve never done this practice before, come along and give it a go. The event will be at The Hub on Saturday 27th October 2018, 0900-1200 inclusive of registration and arrival time, event and refreshments. It will be led by top yoga teachers Sarah Durney Hatcher and Emma Isokovi from Meadowlark Yoga and will be supported by lululemon Edinburgh. Continue our work with local military veterans with PTSD and develop new veteran programmes and retreats in the city. Expand our work in prisons and secure mental health settings. Extend our important work with Ourmala supporting refugees and BME women in Edinburgh. Continue our work with people in addiction recovery by continuing our womens yoga programme with Womenzone at Comas offering weekly classes and a retreat for women affected by trauma, giving them an opportunity to relax and come to terms with their experience. Start a scholarship programme that offers outreach students the opportunity to apply to receive mentorship and scholarship to engage with yoga in other studios and in teacher training. When you sign up you are committing to raise a minimum of £75 for Edinburgh Community Yoga, however, the target is £108. Follow this link to register for the 108 challenge and hit the ‘start fundraising’ button to get going.